Kevin Smith has authored/co-authored at least 1 Book(s) base on or surrounding serial killers. Serial Killers mentioned by this author include John Eric Armstrong, Stanislaw Modzelewski, Andrei Chikatilo, Jack Unterweger, Anthony Allen Shore, Gary Ridgway, Shawn Grate, Juana Barraza, Kaspars Petrovs, Dennis Nilsen, Huang Yong, Steve Wright, Peter Woodcock, Fred West, Carl Eugene Watts, Faryion Wardrip, Lesley Warren, Henry Louis Wallace, Manuel Delgado Villegas, Chester Turner, and 144 other serial killers. Plus 160 More Serial Killers. 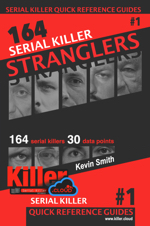 Kevin Smith has 1 Book(s) listed on Killer.Cloud used for the purpose of documenting facts about Serial Killers listed in our database. Publishers include Mindlock Innovations, The publisher(s) and author(s) listed hold all rights related to the property of work and/or the property's copyright. The below books were authored or co-authored by Kevin Smith.